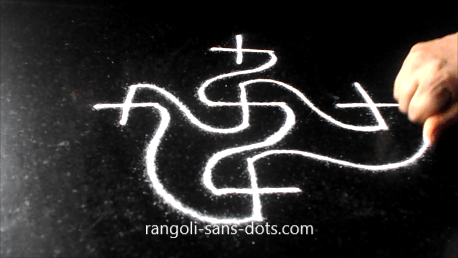 Some rangoli may appear simple but are difficult , some kolam may appear difficult but are actually simple. 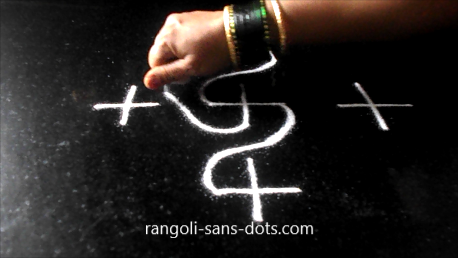 While it said that there is Mathematics in kolam , my children say that sometimes kolam are similar to Mathematics problems - when you read a sum in the question paper but when you try you are stuck some where similarly some rangoli appear to be easy but when we try we are not able proceed after a point. .
Lines kolam of this type give a different perspective to kolam but do not come under the classical kolam designs. 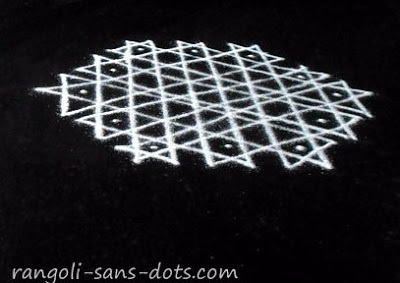 These kolam are patterns formed using number of horizontal and inclined lines that meet , intersect to form a design. 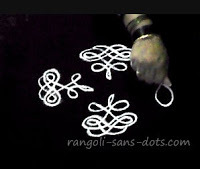 These type of kolam is a good exercise for the mind for the mind due to the energy required to concentrate. I can assure you that a lot of concentration is needed. 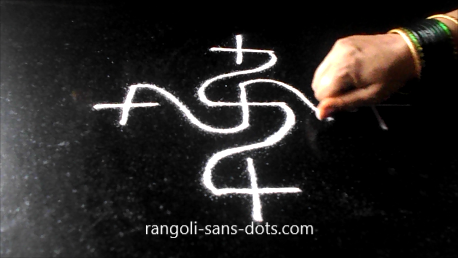 It is not that other kolam do not need concentration. 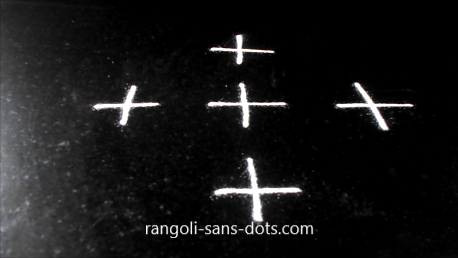 Even a small 5 dot kolam needs focus are we may miss the the next steps. 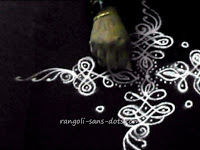 The end result is a beautiful pattern forming start like patterns through out the kolam. 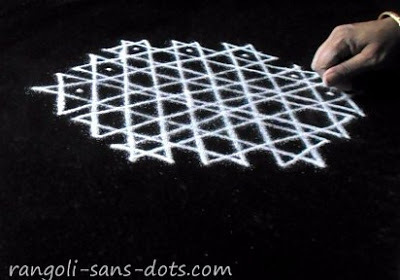 Dots can be placed inside the kolam to make it more beautiful. 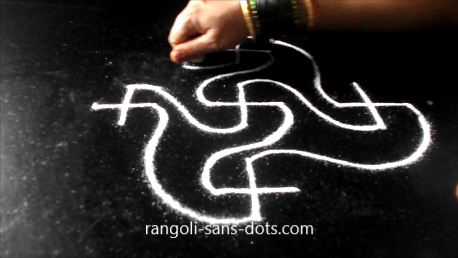 We can place colourful dots instead of white dots to make suitable for festivals like Pongal and Diwali. The images show the steps involved . 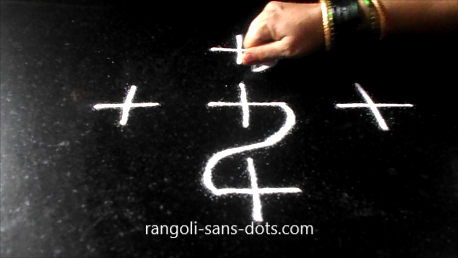 We can add some free hand patterns around to the kolam too. 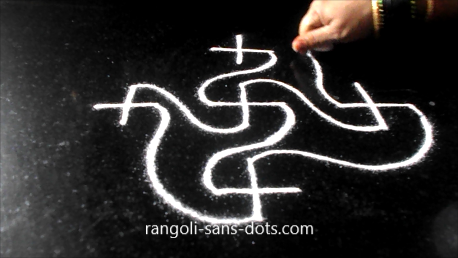 One of most important aspects in drawing a kolam is that we have to avoid moving around the kolam while drawing it. This is easy for small and medium sized kolam. 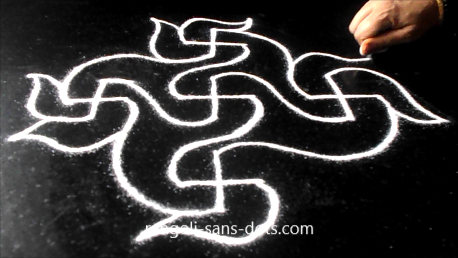 It is somewhat difficult for bigger kolam designs. 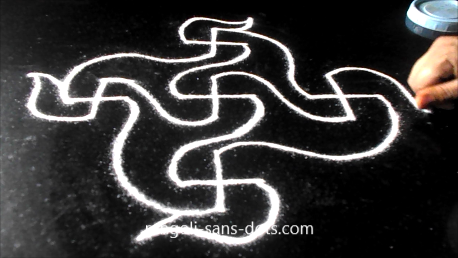 The kolam below shows a repeated simple pattern drawn in four directions. The trick here is that all the patterns have been drawing from one side only. So we have to visualise how to start the pattern . 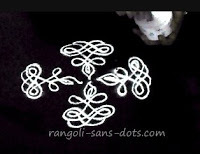 While most small rangoli designs are simple and easy , there are some small rangoli that can be challenging, the kolam above is one of them . 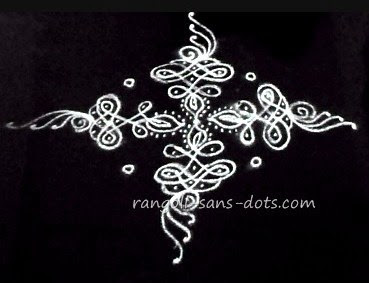 Some sikku kolam designs that are small can be very challenging too. I have shared some of those designs in a separate post. 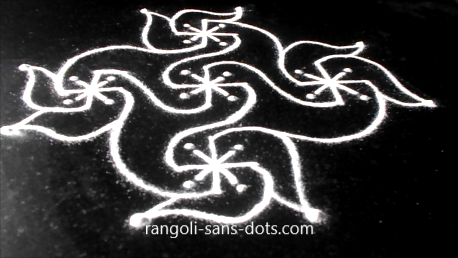 The next kolam may not be in the difficult rangoli category , an uncommon design that we find drawn at the entrance. 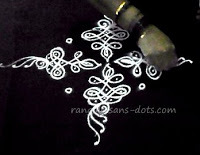 I have shared the basic and smallest design in this type . 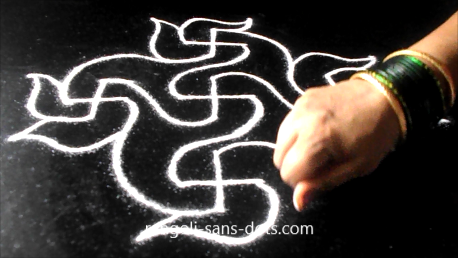 This kolam can be made bigger and bigger. It uses plus signs connected with curved lines. It may not be difficult but definitely it is tricky. 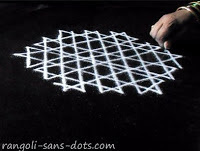 After seeing this the steps for this kolam through the pictures below, I request you to take a pen or pencil and a notebook or a sheet of paper and draw it. If you get it right the first time hats off to you !